available. 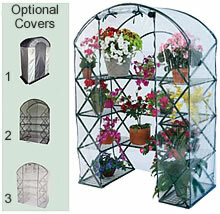 Choose from over 12 different portable greenhouse styles and sizes below. • Flowerhouse Instructions: Click on any model shown above for more information and a link to its instruction manual. Extend your growing season by several months! These space saving mini portable greenhouses provide you with an inexpensive way to get a jump-start on growing in the spring and extend it longer into the fall. They are also a great inexpensive option for overwintering plants. Flowerhouse portable greenhouses are compact and lightweight for easy transport, setup, and take down. These mini greenhouse kits require no tools for assembly and most can easily be built in 30 minutes or less. They can also be taken down just as easily and stored in a garage, basement, or even a closet. The Gro-Tec™ cover is made of reinforced woven polyethylene which is UV protected and has 80% light transmission. This covering includes a door (or access panels for the smaller models) and screened windows for ventilation. All of the windows have built-in screens to keep out animals and insects out of the greenhouses. Adjustable benches not included. This kit includes all you need to repair accidental punctures, rips, and tears to any greenhouse film covering. It also includes a commercial stitcher with thread to repair stitched areas around doors and end walls that wear over time. All Kits include: 6" wide, UV resistant, poly patching tape, and outdoor plastic adhesive & sealant. Speedy stitcher kit for repairing sewn areas is available also. Portable greenhouses are shipped by UPS and delivered in 2 to 7 days.